The United Nations Educational, Scientific and Cultural Organization’s (UNESCO) synopsis of the site describes Palmyra as, “…one of the most important cultural centres of the ancient world” (“Site of Palmyra”). This is largely due to its multiculturality, multiple imperial influences, and lengthy historical and archaeological records. The site of Palmyra stands in the heart of what is now Syria, a palm oasis situated between the Palmyrene mountain belt and the Syrian Desert (“Palmyra”). The al-Qubur wadi runs through the city, north of which most phases of construction were focused, and to the south lies the Efqa spring (“Palmyra”). It was first mentioned in archival, cuneiform tablets recovered from Mari, in modern-day Syria, dating back to the second millennium BCE, to the time of Sargon of Assyria, which mention the location as a destination for trade caravans, while another tablet recovered from Emar, dating to approximately the same time, refer to “…the names of two ‘Tadmorean’ witnesses,” Tadmor being the city’s original name (the etymology of which is obscure) (“Palmyra;” Seyrig 1; “Site of Palmyra”). Fig. 1. Palmyra. “Palmyra (Syria), Part One.” Geographylists.com. n.d. Web. 15 Dec. 2016. However, archaeological evidence suggests that Tadmor was occupied long before its appearance in the historical record. The Efqa spring attracted populations early, having created a hospitable environment in the middle of the unforgiving Syrian Desert. “As a result of its extraordinary location at the important trade route between the ports of the Mediterranean Sea and the [Euphrates], Palmyra has been settled since Paleolithic times” (Linck and Fassbinder 21). The spring has yielded lithic tools that date to between 7,500-7,000 BCE, a time when the area was only a small, ephemerally occupied site (Hornblower et al. 566). Until the 1st century BCE, however, the site was located south of where most of the monumental structures stand today, a smaller city comprised of about 20 hectares, indicating prosperity before the era of Roman occupation (Linck and Fassbinder 21). 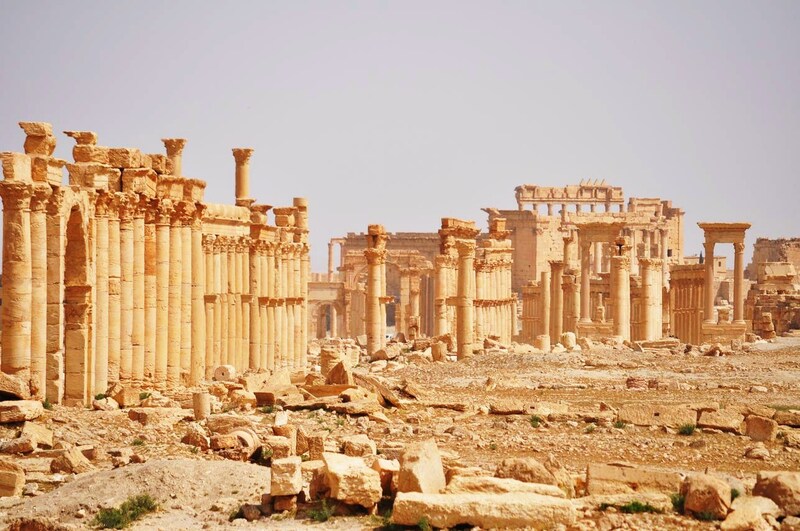 It is during this phase of occupation that what we know as Palmyra today began to take form. [This] was due to the clever policy of its merchants and camel-riders who knew how to keep order in the desert between their town and the great factories and warehouses of Lower Mesopotamia. From that time caravans were able to cross the Syrian desert instead of skirting it, and the transit brought huge profits to the [Tadmoreans] (Seyrig 1). In 41 BCE, Marc Antony “…unsuccessfully tried to conquer the city,” largely because of its growing economic significance to the Parthians, after which, “the oasis secured its independent position between Rome and Parthia (Hornblower et al. 566; Seyrig 1). This attempt at taking Palmyra is believed to be among the reasons that Parthia declared war on Rome (qtd. in Seyrig 1). Ultimately, at the dawning of the 1st century CE, Tadmor was annexed into the Roman Empire as part of the province of Syria, at which time the city was given the name Palmyra (Hornblower et al. 566; Linck and Fassbinder 21). It then fell to Tiberius “…to restore Roman prestige and to consolidate the power of Rome by annexing Cappadocia, the door to Armenia and the back-door to Parthia. It is in these years that the first manifestations of wealth and civilization appear in Palmyra” (Richmond 44). The annexation brought “…soldiery, the use of Greek and occasionally Latin alongside Aramaic, … taxation (Tariff Law), administration, … urbanization, and religious syncretism” (Hornblower et al. 566). In retrospect, British archaeologist Sir Ian Richmond describes the site’s significance, stating, “The especial archaeological value of Palmyra is that it displays the effects of interchange between East and West in a community permeated by the interests and influences of both,” namely, at the time, those of Rome and Parthia (43). In contrast to its time under the Seleucids and Parthians, Palmyra throve under Roman rule. Per UNESCO, Palmyra “…grew steadily in importance as a city on the trade route linking Persia, India and China with the Roman Empire, marking the crossroads of several civilisations in the ancient world,” giving the city its unique architectural aesthetic (“Site of Palmyra”). By the 3rd century CE, “…the Palmyrenes had created a handsome, largely limestone city, combining Semitic, Greek, Roman, and Parthian features,” including walls, gates, the great Temple of Bel, Romanized temples (like the Temple of Baalshamin), the Great Colonnade, and the Tetrapylon, among other notable structures, and it controlled a trade network stretching from Spain to the west and China in the east (Linck and Fassbinder 21; Hornblower et al. 566). In this trade network, “Imports included Chinese silks, [Roman] imperial and Athenian marble statues, and mosaicists” (Hornblower et al. 566). By the mid-3rd century CE, the Palmyrene prince Septimius Udaynath (Odaenathus) and his queen, Septimia Zenobia, had created a Roman-style empire (Hornblower et al. 566). Initially, Odaenathus’ career was marked by defending Rome’s territory in Mesopotamia from the Persians, but when he was succeeded by his son, Vaballathus, Zenobia became queen regent of the Palmyrene Empire, officially seceding from Rome (“Zenobia”). At the height of her territory’s expansion, Zenobia controlled lands from Anatolia to Egypt (“Zenobia”). Perhaps inevitably, her empire was not long after razed to the ground by the Roman Emperor Aurelian c. 272 CE, and some decades later, emperor Diocletian constructed a large camp, defensive walls, and a bath complex at Palmyra (Hornblower et al.). Two and a half centuries later, Justinian refurbished many of the temples as churches and reinforced Palmyra’s defenses, before a series of Arab conquests a century later, which would persist, more or less, until the city’s rediscovery by Western Europeans in the 18th century as one of the most influential cities in the neoclassical movement (Hornblower et al.). Palmyra ultimately emerged from antiquity, its ancient ruins relatively intact. Excavations began in the late 1920s, and the city has been a consistent point of study ever since—that is, until the Syrian Civil War erupted in 2011, a conflict that would scar the face of Palmyra irreparably. Hornblower, Simon, Antony Spawforth, and Esther Eidinow. The Oxford Companion to Classical Civilization. Oxford: Oxford University Press, 2014. Print. Linck, Roland, Jorg W. E. Fassbinder, and Konstantinos Papathanassiou. “Multipol-SAR-Survey of the UNESCO World Heritage Site Palmyra (Syria).” Archaeological Prospection. Ed. Drahor, Mahmut G. and Meric A. Berge. Istanbul: Archaeology and Art Publications, 2011. Print. “Lion of Al-lat.” Wikipedia.com. Wikipedia. 14 Aug. 2016. Web. 15 Dec. 2016. “Palmyra.” Wikipedia.com. Wikipedia. 7 Dec. 2016. Web. 12 Dec. 2016. Richmond, I. A. “Palmyra under the Aegis of Rome.” Journal of Roman Studies 53.1-2 (1963): 43-54. Print. Seyrig, Henri. “Palmyra and the East.” Journal of Roman Studies 40.1-2 (1950): 1-7. Print. “Site of Palmyra.” Unesco.org. UNESCO World Heritage Centre. n.d. Web. 12 Dec. 2016. “Temple of Baalshamin.” Wikipedia.com. Wikipedia. 10 Dec. 2016. Web. 15 Dec. 2016. “Temple of Bel.” Wikipedia.com. Wikipedia. 11 Dec. 2016. Web. 15 Dec. 2016. “Zenobia.” Wikipedia.com. Wikipedia. 13 Dec. 2016. Web. 15 Dec. 2016.